Angel fights and uneasy ghosts and kidnapped friends, oh my! This episode gave us that and so much more. The “more” would be my growing frustration with a certain Winchester, but I’m still hanging onto the hope that it will all work out in the end. It has to, right? First off, let’s go over the angel situation. I am always wary of Cas’s intentions, even when they seem good, because I’ve seen how off-track he can get in certain circumstances. But it felt like he was walking the good path this time. Bartholomew is bad, let’s stop the bad angel, straightforward task. There was the uneasiness of watching Cas choose whether to ally himself with Bartholomew in order to eventually topple Metatron or whether he would strike out on his own and try to take them all down because it was the right thing to do. But in the end he proved that good is worth fighting for and that he will only forgive one misstep before he takes out a brother-gone-rogue. 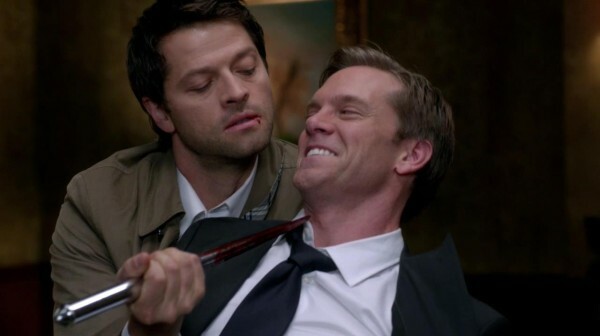 Since Cas has now killed what I assumed to be one of the big bads this season, who are we rushing to battle against? Metatron is high on the list, of course, and maybe Abaddon is, too. Are they the two we should be focusing on? Or is there a sleeper enemy in our midst? Now that Cas is starting to grow a following of his own, will he be a threat under the guise of power? It’s all a bit murky in terms of who to concentrate our attention on for now. I’m hoping it gets clearer as we progress. Moving on to less murky situations, it was great to see two familiar faces return, even if the circumstances were bittersweet. Kudos to the advertising department because, for once, they managed to keep a secret as to guest stars. We not only got Ghost!Kevin haunting the bunker, but also Not!Dead!Linda Tran. It was a two-for-one surprise that I loved. Poor Kevin. His life was made miserable and short as a result of his association with the Winchesters. For the short time he was alive, he was the best prophet he could be, yet he was a victim of the Winchester curse, as have been many others over the years. You just don’t associate with Sam and Dean and expect to live very long. I was sad to learn that he, as well as everyone who has died since the angels fell, was stuck in the veil and denied entry into Heaven. When Metatron locks the gates, he really does it. I’m interested to see if the boys will be able to set things right, so that the spirits can rest easy once again. Kevin deserves to be allowed eternal peace. After all, he’s more than earned it. And then we have Kevin’s mom, the lovely Linda Tran. Crowley said that he killed her, taunted Kevin over that fact, but we all know that demons lie. 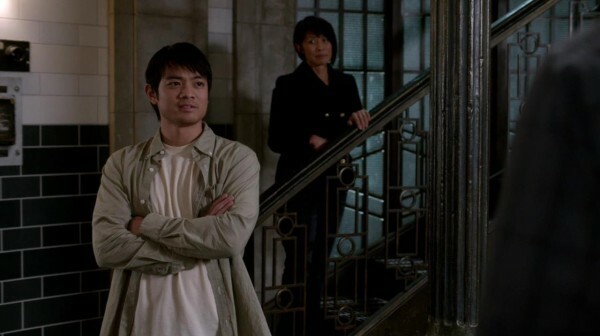 When Kevin returned and asked the Winchesters to find her, it was possible that they could cast it off as a young man in denial, if not for the fact that there was something much deeper going on. Crowley had Mrs. Tran, that much was true, but he didn’t quite kill her off as promised. No, he was holding her hostage, along with a number of other worthy pawns. And what made it worse is that their prolonged torture might not have been so lengthy had it not been for the fact that Sam and Dean were keeping Crowley locked up as well. In his absence, his little minion was handing out agony to the unfortunate prisoners. But in the end, mother and son were reunited. Mrs. Tran was rescued by Sam, Kevin was allowed to tag along with his mother to head back home, and all seemed right in the world. We even got the boys to promise that they’d put their anger aside and get over it. Despite their differences, Sam and Dean need to see how lucky they are. Kevin’s dead, his mom’s taking home a ghost. At least the boys are still alive, still together. 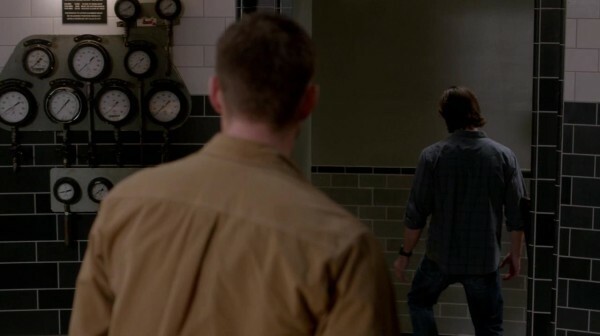 Sam and Dean stood there and promised Kevin that they would abide by his wishes. And then, when Kevin departs and Dean looks like he’s ready to talk it out, Sam just walks away. No word to his brother, just goes to sequester himself in his room. In defeat, Dean does the same thing. This is not helping, guys! I just don’t get what Sam’s deal is. This is way past holding a grudge. This is lying to his dead friend and continually breaking his brother’s heart, and mine as well. Why, Sam, why? Maybe we’ll get some answers soon. I’m hoping so. Otherwise, my aggravation levels are going to reach new heights. Please let the season reach a satisfying solution to all this Winchester distance. I hate to see the boys at odds. You don’t know what Sam’s problem is? Seriously??? I am so sick of the ‘Dean’s heart was in the right place, Sam should be grateful’ brigade. Dean may have apologized but he has never admitted he was wrong for constantly trampling over Sam’s wishes and choices. I used to love Dean, he was my favorite and now I can’t stand him. He’s hypocritical and self-righteous. Yes they need to move past this but Sam should not roll over to forgive and forget until Dean understands why he was so completely wrong. @anna: I’m not saying Sam should just roll over and instantly forgive Dean. The actions that Dean took removed Sam’s ability to choose. I totally get that and I understand why Sam’s angry. What I don’t understand is the last scene. He stood there and promised Kevin that he and Dean would talk it out and then when Kevin’s gone and Dean turns to complete that promise, Sam walked away without a word. The way it came off was “I’m going to lie to my dead friend to his face and then not carry through with my promise.” I don’t need instant forgiveness, I need them to talk so that Dean can understand why what he did is causing Sam to react this way. Because, right now, he’s not getting it and they can’t move forward.